Its been awhile since I've done a ColdFusion quicke post and I found this trick to be quite useful especially when dealing with ORM domain entities. Lets say that we have a domain object called User that gets populated out when a user signs up for an account. This object has some simple properties; fullName and email (lets not get into object purity here and say that those should be a member of a Contact object). Lets also assume that when a user signs up all only an e-mail address is required, they can leave their name blank if they choose to. The important thing to note here is that when a user object is loaded from the database the fullName property may hold a value of null. As you can see in our example, we check if person.getFullName()does not return null and pass that value if its true, otherwise pass in a default value of "User". jQuery.Deferred(), introduced in version 1.5, is a chainable utility object that can register multiple callbacks into callback queues, invoke callback queues, and relay the success or failure state of any synchronous or asynchronous function. That is a bit of a mouthful. I like to think of deferrds somewhat like a telephone call. You'd like to contact someone so you dial a number. Based on what happens when you call that number you will take action. If the callee answers the call you can start a conversation, if you get their voice mail (I almost said answering machine but I'm afraid that some readers will have no idea what that is) you can take leave a message. Also, when the phone is ringing you can even do something else, you only care about what happens once the number you are calling responds in some way. This is an extremely simplified way of describing how Deferreds work because Deferrds can do so much more. If you've used jQuery's AJAX functions you've already been taking advantage of Deferreds, the AJAX functions are actually using Deferrds behind the scenes with a lot of the details abstracted out for you. When talking about Deferreds its important to note that there are two parts to each Deferred implementation: the callers and the callees. The callers are the functions that either do something that other functions are waiting for or functions that take action based on the results of another function. The callees are the functions that depend on the results of at least one of the callee functions. func1(), func2(), and func()will all be called at approximately the same time. Functions passed into when are expected to return a promise object back to the when() function. This promise will either be resolved or rejected (more on these in the callees section) by the function passed into when, and based on this result one of callback functions will be called. The second part of the callers are the functions that respond to the results of the functions passed into the when function. The three functions are: then, done, and fail. The then(doneCallbacks, failCallbacks) is a single method that encapsulates the functionality of the done() and fail() callbacks. The first argument to the then function is a function, or array of functions, that will be called when all the functions passed into the when() function are resolved. The second argument passed into the then function is a function, or array of functions, that will be immediately invoked as soon as any of the functions passed into the when() function are rejected. The then and done functions will receive arguments from each function passed into the when function, in the order they were passed. These arguments are passed into them via the resolve and reject methods (we will talk about when we discuss the callees). If you'd like to be a bit more expressive in your code instead of using the then() you can specify the doneCallbacks and failCallbacks in the done() and fail() methods. These methods are called the same was as the doneCallbacks, and failCallbacks of the then() function. Its important to note that if a function passed into when does not implement this Deferred pattern it will immediately be treated as resolved. The intent of this code is to fade out any current content, get some tweets from twitters search API, and finally display the new tweets. When any of the buttons are pressed you'll quickly see that something isn't right, and this is because the code being called relies on asynchronous operations like doing an AJAX call and jQuery animations. One approach to fix this would be to put the getTweets function as a callback to the cleanDiv function's fadeOut callback, move the addTweets function to the ajax calls success callback, and finally move the the $tweetDiv.fadeIn('slow') code to the addTweets function. Doing so would tightly couple this code together making it tough to extend and maintain. A better solution would to use the power of jQuery's Deferred object. The first thing you probably notice is that there is more code in the new click handler. The Deferred calls do add a bit of code, but I feel this code is quite expressive (meaning that the intent of the code is very clear) and each of the callback functions are decoupled from any function they are waiting on. One other thing to note here is the use of the done() and fail() callbacks. In the done() callback I use the when() and then() methods of the Deferred implementation. Here I am only specifying a single argument which will get called if/when the addTweets function passed into it has completed. Since I'm not going to reject the promise anywhere in the addTweets function only passing in a done callback is sufficient. Since there is no access to the internal representation of the $.ajax method's Deferred function I have to wrap the entire function in a Deferred call. Another thing to note is that Twitter's API will return a 200 status (which will invoke the ajax function's success callback) even if there is an error so I will inspect the object returned from Twitter when determining weather to resolve or reject the Deferred object. If a key of "error" is found in the data returned from Twitter I reject the Deferred which tells our click handler function to run the fail callback. I'll also pass a message to the fail callback through the reject method call. Putting it all together we get a nice and smooth implementation of our application. As you can see I've also included an error button which will trigger an error in the twitter API. If you run the code you'll see that you get "Hello, undefined" instead of "Hello, Homer Simpson". The reason is simple, jQuery used the link as the context of this where no myName property exists. Enter jQuery.proxy. Takes a function and returns a new one that will always have a particular context. If you look closely you'll notice a slight difference, the callback is now invoked in an anonymous function instead of passed directly to the on() method. This is because the apply method invokes the function immediately whereas jQuery's proxy function only returns a reference function for later invocation. This is a bit nicer because it makes for slightly more terse code. it assignes a unique ID to the function. This is very important because when trying to unbind a function you may not be unbinding the proper function if you are passing in the function to the off() method. Its best to always use namespaced events when using on() and off() with $.proxy(). This code will run function a() then b(), even if the ajax request in a() has not yet completed. Using this code there is a good chance that the models will be an empty array when we try to add them to the dropdown. Also, when the collection's fetch() completes the app.contacts.models array will be reset, meaning that the reference to the contacts in your view likely will not reference the current app.contacts.models array. Now we will always be working with a populated collection in our addContacts method. jQuery's one function is an extremely useful function when you want an event to fire exactly one time. According to the official jQuery documentation use one to, "Attach a handler to an event for the elements. The handler is executed at most once per element" One is a much more terse way of setting an event handler and calling unbind() or off() in the handler function. You can click the link as many times as you wish, however the event will only fire once. One additional thing you can do with the one function is use an additional selector to pass into the one event that will attach the event to exactly one of the descendants of the matched set. In the following example click on any of the li elements, then click on another, you'll see the event only fires for the first element selected. Screencast: Contribute to the ColdFusion Koans in 3 Minutes Without Git! You may have heard about my recent ColdFusion Koans Contribution Drive, if not I need to do a better job making noise about it! Just to reiterate, I'm giving away TWO copies of ColdFusion builder to lucky participants. I'm also giving away a sweet GitHub sticker to the next 8 people to add a test through GitHub. Since GitHub may feel like a barrier to entry for some people I've created this screencast to show just how easy it is to contribute to the Koans project without even having to have git installed on your system. GitHub has a fantastic online editor that will allow you to edit the Koans source files without actually affecting the master branch of the project. When you edit a file online GitHub automatically will put a new copy of the project in your account where you can edit away then send me a "pull request" in two clicks! Contribute To the ColdFusion Koans from Ryan Anklam on Vimeo. *Updated* ColdFusion Koans Contribution Drive - Win A Copy Of CFBuilder! 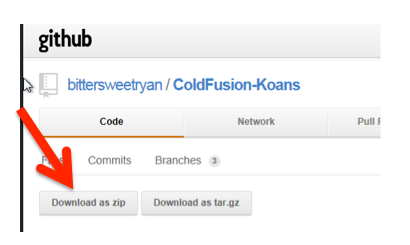 The title says it all, its time for another ColdFusion Koans contribution drive. One thing that the title does not say is that I'll actually be giving away TWO copies of ColdFusion Builder! Adobe has been generous enough to sponsor this drive and donate the two copies of ColdFusion Builder, I can't thank them enough for their generosity. Now its our turn as a community to show Adobe what we can do. Right now the Koans test suite sits at 80 lessons, I'd like to see that at least double. Please share the word with your fellow developers, tweet about it, blog about it. Lets rise up and show Adobe how awesome the ColdFusion community really is and how much we care about the next generation of ColdFusion developers learning not only the ColdFusion language, but the proper way to write professional code. In addition I'll send a GitHub sticker for the first 9 people who submit a pull request that is brought into the Koans project. Don't worry, there aren't many reasons why I won't accept a test; only if I find something incorrect with a test or a test is duplicating an existing test will I not pull something in. In those cases I'll likely just ask you to correct something and resend the pull request instead of flat out rejecting anything. I'd like to thank Mike Henke and John Whish (of ORM Book fame) who have graciously volunteered their time to help me review the entries to make sure the Koans project is a high quality learning tool for everyone. By now you are either ready to get to work or you are completely lost. If you are lost let me back up a second and explain the Koans project. Here is a little introduction to the ColdFusion Koans post I did awhile back, and here is a screencast on getting started with the Koans. In summary, the Koans are a set of unit tests that are designed to teach people ColdFusion and Unit testing at the same time. You download the Koans, copy the directory to your webroot, open index.cfm, then edit the source code to make all the tests pass. There is a Readme included in the project's source file that has a few suggested topics such as new ColdFusion 10 functionality, more unit testing lessons, and object oriented topics. However feel free to add anything you think would be useful to someone learning unit testing or ColdFusion. Add a test for a particular tag you find yourself using a lot. Add a test for a pattern you find particularly useful. Be creative! I don't know anything about unit testing. Thats just fine, and the Koans are for you! I suggest working through the Koans (you'll even get an entry for doing so, see the "How Will The Contest Work") and I'm sure you'll learn a thing or two about unit testing and come up with an idea or two to make the Koans even better. Now that I've gotten that out of the way let me tell you how the contest will work. Each new test added to the Koans project will get you one entry into the drawing (If you have no clue where to start see the "I don't know GitHub Section" below). If you add 5 new tests you'll get 5 entries into the drawing. If you complete the Koans project and tweet a picture of the completed koans with the hash tags #ColdFusion #Koans you'll get an entry into the drawing. If you blog about the Koans you'll get an entry into the drawing. I'll be selecting the winners on June 30th at approximately 12:00 PM central time. I Don't Know Git or GitHub! Download the source code by going to "Downloads"
Click on the Download as .zip link to download the Koans source code. Extract the .zip file into your webroot and rename it to something a bit more friendly, I use ColdFusion-Koans. Open the directory in your browser, typically something like http://localhost/ColdFusion-Koans/index.cfm to make sure everything is working. Open any of the Lesson files in your favorite IDE or Text Editor. The lesson files are located in the "Koans" directory, each lesson has its on .cfc. Add a new test to any of the lessons by adding a new function that is public in visibility. Refresh index.cfm in your browser to make sure that everything looks good. Assuming that you have a GitHub account (if you don't it only takes a second to signup), goto the Koans project page and browse to the .cfc file that you just edited. Click on the "Edit This File" button. Copy and paste your code from your IDE into the text editor GitHub provides. Add a descriptive Commit Message below the code and click on "Propose File Change"
That's it. I'll get the pull request and bring your changes in. If you have any questions please feel free to contact me at ryan.anklam@gmail.com or on twitter at @bittersweetryan. Good Luck Everyone! The deck can be navigated by using the "left" and "right" arrows on your keyboard or by clicking on the left and right arrows on the presentation itself. If you didn't attend my presentation, this deck contains a lot of code, and its all embedded and runnable within the presentation itself. Clicking on the "Run" button in any of the slides will demonstrate the concepts being presented in your browsers console. I'd like to share the notes I took during this years cfObjective. All the sessions I attended were excellent and I learned a lot listening to such smart people! Marc must be such a compelling speaker that I was too focused to take notes because they really stink for this session. There are two types of programmers; those who prefer full featured IDE's and those who prefer a lightweight text editor. I used to be firmly planted in the IDE camp happily opening CFBuilder, CFEclipse, or Aptana every morning to work on my ColdFusion, PHP, and Ruby projects. Recently however, I have switched camps. I now have SublimeText 2 and a Terminal open whenever I code and this post will try to explain why I made the switch. Let me start by defining what I believe an IDE is. To me an IDE is a prepackaged toolbox with many of the tools you'll need for a job. Its a lot like the Mechanics Tool Tool Kit from Sears. 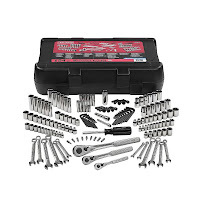 In it you get here all the tool necessary to complete the basic tasks a mechanic does. 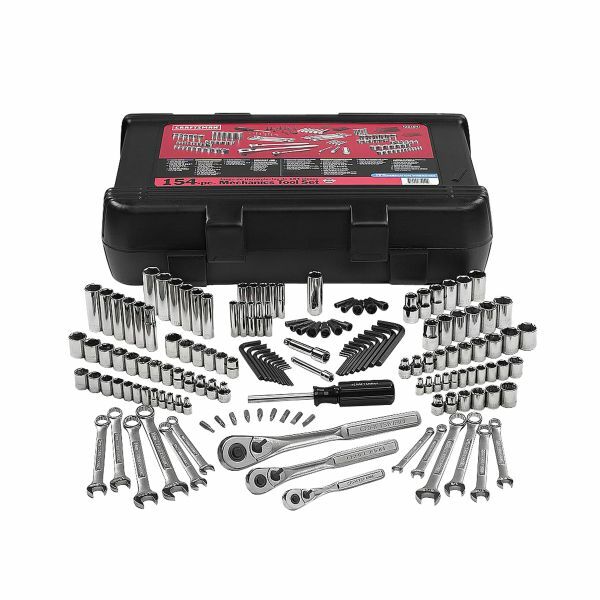 Two things stand out here, what you don't get, and the fact that you have to lug around all these tools just to get to one single wrench. Is that socket driver the highest quality tool you can buy at Sears? Likely not. Yes, CFBuilder has code insite and intellisence, however it was often a bit too slow and a bit too buggy for me, sometimes it worked, sometimes it didn't. I never got the feeling that it was actually helping me code faster. On the other hand knowing the names and types of arguments on my components is awesome and definitely something that I had to be willing to give up when making the switch to a text editor. Guess what? I don't miss it one bit. I also use SVN and GIT as my two primary means of source control. While subclipse or subversive were nice, they rarely worked 100% of the time, especially when I made the switch to a Mac. I had problems checking projects out where after going through the whole process of setting up the project eclipse would never bring any of the code from the repository so I'd have to start all over. On my Mac it was a total crap shoot when I'd try to synchronize. I also tried to use some of the SQL tools inside of Eclipse as well (I think I even blogged about the SQL Editor in CFBuilder once) but I never found them quite as useful as the external SQL tools that I regularly use. Additionally I used the console view in my IDE quite a bit to write debugging output, this feature is nice, but is easily replaced by tailing a log in the terminal. Lastly in order to support all of these areas of functionality an IDE needs to use lots of screen space. When I'm coding I like to see two things: the folder structure of the project I'm working on and the code itself. When I was using an IDE I found myself constantly readjusting the windows within my workspace. Maximize the code, minimize the code, show the console, show the server, team synchronization view. It was distracting to say the least. While I was happily coding in my many flavors of Eclipse I'd see many developers talking about Textmate, Notepad++, VIM, and EMACS. I'd frequently half heart-idly try out E (textmate for windows) but I'd always go back to CFBuilder after a short time. While I found that I liked the look and feel of these a bit better than Eclipse I failed to see what all the hype was all about. The first "a-ha" moment I had was when I was using E and typed in cffunction -> tab, then I pressed tab again. OK, this is sort of nice, I can fill out a whole tag and cycle through all of its attributes by pressing tab. This was nice but when I write functions I don't always use all the attributes. The next step I took towards text editor bliss was to customize the snippits I used the most to match the way I wrote my code. Shortly after I was writing code faster than I ever was before. Little by little I started to use E more than CFBuilder and Aptana. This brings us to the point where I installed SublimeText 2 on my machine and started playing with it. This article on Nettus+ changed things forever. One of the things I really liked in eclipse was using Ctrl-Click on a component definition in a file to be taken directly to that component in the editor. I thought Ctrl-P was a lot like the "Open Resource" function in Eclipse, however, what I didn't know is that SublimeText will instantly preview a file in the editor as soon as it gets focus in the search result list. SublimeText also remembers what files you recently worked on so those files come up first in the file list. I was finding and opening files faster than ever. Adding the power of Ctrl-R to quickly find a function in a file I can go to a specific function in a component faster than I can by doing a ctrl-click in eclipse. SublimeText is the Snap-On Torque Wrench of code editors. It does one thing and it does it extremely well. Additionally now that I wasn't using Eclipse for everything I had to find alternatives for the other things that Eclipse did for me like SVN, GIT, Ftp, and viewing log files. For the most part the replacements I found have far outperformed what was available in Eclipse. For instance on my Mac Cornerstone has been a great replacement for the SVN integration in Eclipse. I love the incoming/outgoing file count. I have less conflicts now because I can see when files are waiting to come in and update more frequently. There are situations where the eclipse plugin outperforms it, but those are far and few between. Lastly are the intangibles that make SublimeText a pleasure to work with. For the first time in my career I have found an editor I am passionate about. An editor that, for me, makes coding more fun. Its the little things that make such a big difference. I love the animations when I close a tab or delete a file. I love the 30,000 foot view of all of my code in a file, I love how the contents of a folder smoothly slides down when I click on it. I also love how easy it is to pull in a color file and have those colors work on all my code instead of having to import 15 different .col files like I did with eclipse. In conclusion I'd like to say that no text editor or IDE will make every developer happy. Each developer should use whatever makes them happy and productive. In the mean time I'll continue to sing praises of Sublime to whomever will listen. But who knows, when CFBuilder 3 comes out I'll probably switch to that for a bit simply because I love trying new things. I'm on a Mac, my company uses a SQL Server, and since there is not native SQL Server Enterprise manager client I was forced to find a workaround. One common solution is to have aVirtual Machine running windows but to me that approach feels like using a sledgehammer to pound in a finishing nail. Thanks to this post on stackoverflow I am able to use Oracle's FREE SQL Developer application to connect to Microsoft SQL Server Instances on my MacBook Pro running Lion. I've used SQL Developer for Oracle development for a number of years now so the learning curve was pretty small for me but anybody who is familiar with SQL Server Enterprise Manager should be able to find their way around pretty easily, however there are a few things to be aware of which I'll discuss a bit later. Before you can install SQL Developer you'll need to make sure that you have the JDK installed on your machine. I have the Java for Mac Developer Preview installed on my machine from: https://developer.apple.com/downloads/. Once the JDK is installed (you can check by opening a terminal and typing javac -version ) the next step is to download and install SQL Developer from Oracle's website here. Once SQL Developer is installed you'll need to get the jDTS plugin files from: http://sourceforge.net/projects/jtds/files/, at the time of this writing the most current version is 1.2.5. Once the zip is download and extracted move the entire folder someplace where your account will have execute permissions on the jdsts-1.2.3.jar file. I have a lib directory in my User folder where I keep all my third party .jar files. You now have everything you need to get SQL Developer executing SQL queries, you just need to do some simple setup in SQL Developer. Open SQL Developer and as of version 3.0 go to Tools -> Preferences and expand the "Database" node. Next click on Third Party JDBC Drivers click on "Add Entry...". From this menu browse to the /jdts-1.2.5-dist folder you copied in the step above and select jdts-1.2.5.jar (or whichever version corresponds to the version you downloaded) and click "OK". 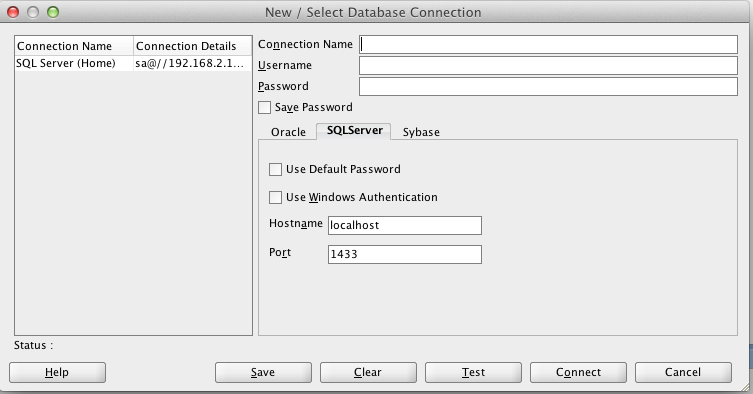 Once you have the plugin installed exit out to the main SQL Developer IDE and add a new connection by either: clicking on File -> New -> Database Connection or by clicking on the green + icon in the "Connections" tab. You should now see a "SQLServer" tab where you can enter the connection information for your SQL Server. If you have not used SQL Developer before there are a few things to be aware of. Since it is primarily an Oracle IDE you have to think in a somewhat "Oracle" way when running queries on your database. Since Oracle is a schema-centric database server you'll save yourself lots of typing if you set a default database for your current connection. If you don't you'll have to type the fully qualified table name for each table you reference in a query (e.g. database.owner.tablename). To do this right click on the database you'd like to use and click on "Select Default Database" in the context menu. Once you do this you can do normal SELECT x FROM Table queries and leave out the fully qualified table name. You'll have to do this each time you connect to SQL Server. 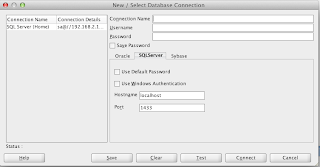 SQL Developer will allow you to do many of the basic database tasks you can do in Enterprise Manager, however there are quite a few limitations. You can view your Table/View structure and data, you can also view most of the other objects in SQL Server like Stored Procedures and Functions. SQL Developer will also allow you write DML (Data Manipulation Language) statements like Update, Delete, and Insert. You can also write some DDL (Data Design Language) statements like ALTER TABLE. However, the one huge shortcoming of SQL Developer is its inability to recognize the "BEGIN" keyword. This means that any statement that uses BEGIN, like transactions, stored procedures, and functions will all generate a syntax error and not execute. One nice "benefit" of using SQL Developer is the "Format" context menu. When I'm writing code I often get SQL statements in debugging code, however, its usually one long string, debugging this code in Enterprise Manager usually meant having to manually update format the SQL, however in SQL Developer I can paste the code into the SQL Worksheet, right click, and click on "Format" and have a nicely formatted SQL Statement. While its not a complete replacement for Enterprise Manager I do find that SQL Developer will allow me to do many of the things I spend 90% of my time doing to my databases. The best part is that this is a completely Free and somewhat mature solution. 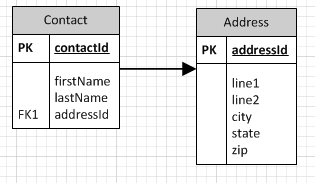 In this example we have a contact table with a foreign key reference to the address table. This means that every value in the addressId column must have a matching value in the addressId table. There may be situations where a contact's address is not known so in order to satisfy the foreign key constraint the value "null" must be stored in the addressId field. Most of this code is quite uninteresting, however, whats important to note is that the addressId field is instantiated to a value of 0 in the default constructor. If we were to write our own persistance layer inserting this value into the database would throw a foreign key constraint error, since there is likely to be no matching Address record with an addressId of 0. Now if we insert a record with the default addressId value of 0 our database wont throw an error because ColdFusion will insert the value into the database, this is assuming that the column does allow the value of of course.